This week on Spellburn we take an in-depth look at Dungeon Crawl Classic’s dragons! Everything from what makes them unique to using the Dragon tables to create our very own dragon on tonight’s episode. The thumbnail is a reworked image by David Revoy available at http://commons.wikimedia.org/wiki/File:Durian_-_Sintel-wallpaper-dragon.jpg under a Creative Commons Attribution 3.0. Full terms at http://creativecommons.org/licenses/by/3.0. Oops! The download link doesn’t work. 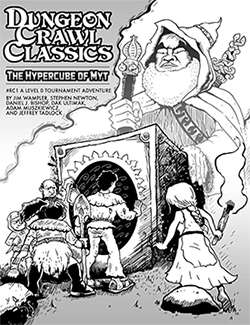 First Dragon in a DCC adventure appears in Crawl #4, in an adventure by Yves Larochelle called The Tainted Forest Near Thorum. The rose dragon in Prince Charming, Reanimator, and the Jabberwock in Creeping Beauties of the Wood were also designed using the tables in the core rulebook. Heh. I forgot the dragon I put in my adventure in DAMN #1. Thank you! This is a nice Christmas present to wake up to. You guys are in the thick of it! This is awesome. Great listen. Just got around to listening… great show guys! Keep up the good work! My earliest gaming was the so-called “Holmes Basic” edition (which compiled and re-jiggered the original booklets that were D&D). Dragons had a variable number of HD based on their type. Then their age determined the number of hp per die. So a White Dragon would have 5-7 HD, and if it was “very young” it’d have 1 hp per die, or if it were adult it’d have 5 hp per die, etc. DCC dragons are using the same method, in essence. Determine the number of HD, and then the age tells you how many hp per die. So if you wanted a poppa dragon protecting his offspring, poppa might have 6 hp per HD, while junior had only 2 hp per HD — but they might well have the same number of HD! I didn’t realize the history on the mechanics. That’s fascinating. Now I need to dig out the old books and read for myself. Good Epsiode, can’t wait to hear another from the judges! Miss you guys! But have a great time at GaryCon.